Yesterday, the nation remembered the horrific event that took place in the United States 15 years ago. That day taught us that our freedom cannot be taken for granted. Each day we need to be kind, tell our family that we love them, and to not take our life or anyone else’s life for granted. Many of those who lost loved ones that day also found that they had no body to bury, no body to place in the sacred space of a cemetery. Cemeteries allowed the families to bury a piece of clothing of their loved one, or a favorite picture of their loved one, or some other special remembrance of the deceased, so that they would have a sacred space to visit, to pray, to remember, and to grieve. After all, “Cemetery” means “sleeping place.” The grieving of 911 realized how vital it was to have their loved one remembered forever. How many of us have had a loved one cremated after their death? After the cremation, what have we done with the cremated remains? Are the cremated remains still on the mantle, in the closet, or possibly, still at the funeral home? The cremation rate is growing yearly, and it is estimated that it will climb to 50% here in Illinois within the next few years. 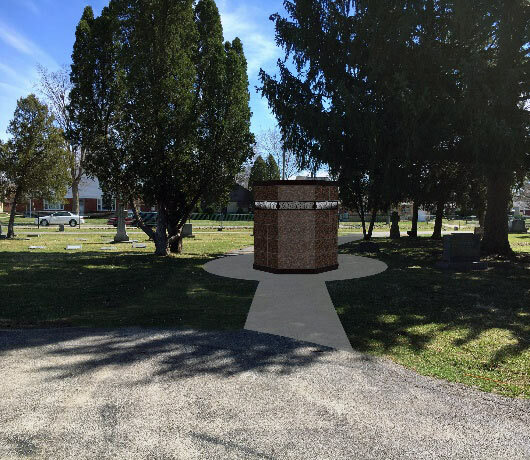 As part of the ministry of Catholic Cemeteries, we are offering to any person who has the cremated remains of a loved one, and who cannot afford the cost of burying their loved one in a Catholic Cemetery, a communal space in the columbarium shown below. This columbarium will be placed at St. Mary/St. James cemetery in October. The middle of the columbarium is hollow and can accommodate the cremated remains which would be placed in a silk “pillow.” (picture shown below). Catholic Cemeteries is offering these inurnments at a very reasonable cost, $150.00, which includes the silk pillow, and all interment costs. The cremated remains will be placed inside the pillow, and placed into the center of the columbarium. If you choose , your loved one’s name can be engraved on the black ribbon that you see in the photo. The cost of engraving the first name, last name, year of birth, and year of death is $150.00. The columbarium itself also has 80 niches available for purchase. The niches are priced at $1600.00 for a single niche. 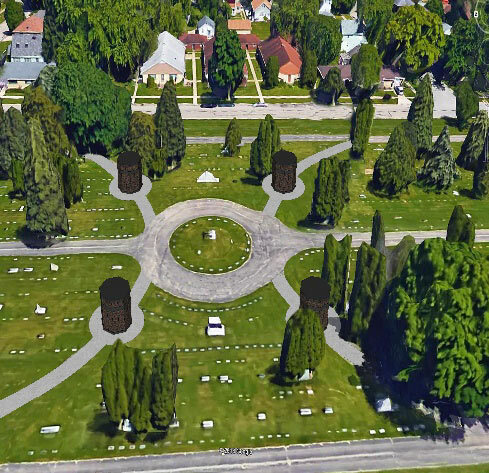 Eventually there will be four of these columbaria at St. Mary/St. James. We are also planning on individual above-ground niche spaces placed along the walkway. These include, but are not limited to: benches, pedestals, and cremation monuments. We also hope to use the walkways in this area for cremation graves, for those who prefer in-ground burial rather than above-ground.